Starting today (August 7th) in Dead By Daylight, the Scorching Summer BBQ event has begun. 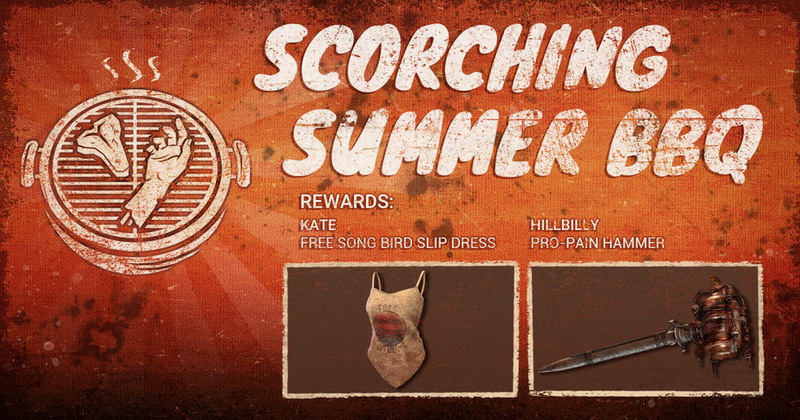 Players who complete the challenges will unlock special customization rewards, such as Hillbilly’s “Pro-Pain” Hammer and Kate’s “Free Songbird” slip dress costume. Once you complete your own goals, you can keep playing to gain bonus bloodpoints and help your friends get their items as well. This event lasts from today until August 21st. Every trial will start with two Frozen Cocktail machines and 2 Grill hooks, and by burning BBQ Invitation Offerings, another Frozen Cocktail machine and Grill hook will appear. As a Killer, hook a Survivor on a Grill hook for the first time to gain 1 Survivor Chop and as a Survivor, complete repairs on a Frozen Cocktail machine to grant all Survivors 1 Frosty Margarita. You can only gain Frosty Margaritas and Survivor Chops in Public Matches.